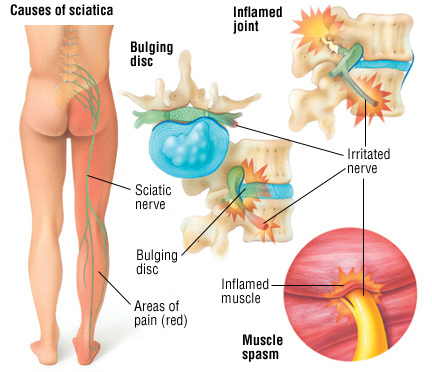 Sciatica is pain caused by irritated spinal nerves. Typically individuals will complain of leg pain down the back of their leg beginning at their buttocks and may travel down into their foot. Individuals may complain of severe pain and numbness/tingling in their leg. The cause of Sciatica may be from spinal nerve roots, tight musculature in gluteal region termed “Piriformis Syndrome”, or from compression of the Sciatic Nerve in the lower extremity.